Comments: Same side pains as in yesterday’s run (between mile 1 and 2). Tried to run through them, but it is nearly impossible. Walking does help. Trying to change my breathing a bit to see if that helps, but couldn’t tell. I brought some (1) vanilla GU to start getting used to it. Wasn’t bad, tasted almost like butterscotch and it didn’t seem to upset my stomach. 🙂 I also brought my ‘fuel belt’ on the run. Comments: Serious side pains after 1.25 miles. Was not able to get rid of the pain for over .5 miles. Ran the last 1.25 without pain. Not sure what happened there. Comments: Not a bad run, just hot (humid) and no water, rather stupid of me. Time: 6:00 am <—- I must be nuts! Comments: I was so ready to go that I actually left my iPod in the hotel. lol Kinda glad that I did, because listening to the birds, the wind blowing through the trees and the splashing of water was a nice change. The first .5 where downhill, after that pretty much flat. Ran 1.5 then turned around and walked .1, then back to running….after about another 1/2 mile my stomach was telling me I had to go to the bathroom (I guess last night’s Mexican food did not agree with me). 😦 So I walked until the urge somewhat subsided, and was able to run the last 1/2 mile (uphill). Didn’t go running today, we didn’t crawl out of bed until 10:30am and headed towards the dunes instead. Going back at it tomorrow!!! I saw someone jogging by and I felt guilty for just a minute. lol I do plan on getting a few miles in tomorrow. 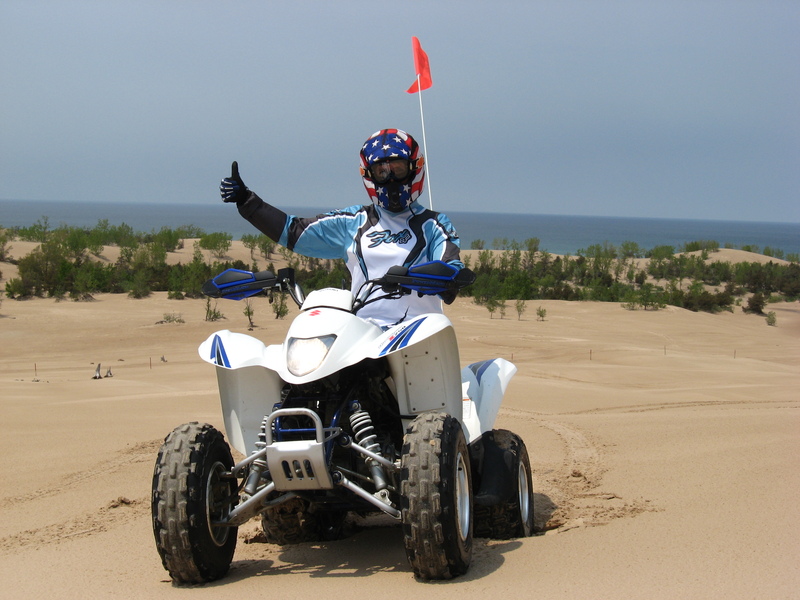 Leaving for a 5 day trip to Michigan to go quadding with the hubby at the Silver Lake Sand Dunes. It’ll be interesting trying to find a good route to do my training runs. 🙂 But then I am thinking that quadding for 4 hours + each day should be a good substitute for running!